Finally put up my Anne Kyyro Quinn wall panel in my apartment this weekend! 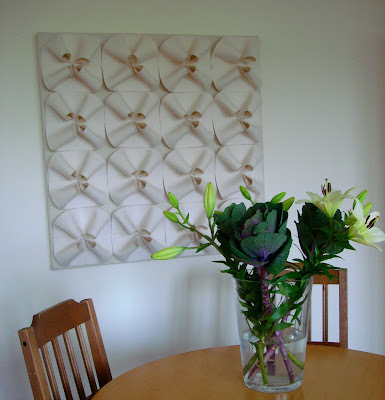 It was a gift from Anne, when I left my position as project manager earlier this year.This particular design is called ROSETTE and it is very voluminous and three-dimensional. 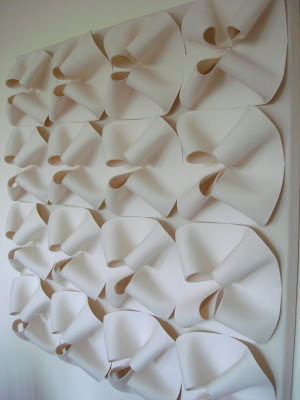 Sheets of felt are folded and manipulated and stitched into place to create the origami effect. This panel measures 1 meter x 1 meter, but Anne is known mostly for her large scale bespoke textile wall installations all around the world. Have a look at the AKQ website to see her other projects.